We make Glass Pot Pourri bowls that find extensive application for potpourri and aroma therapy purposes. These Glass pot Pourri Bowls are designed to offer a warm, woody fragrance that enhance the overall atmosphere of the room surroundings. Further, these are also hand painted so as to provide in these exclusive finish standards. 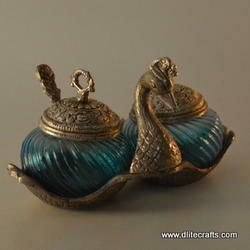 Keeping the diverse requirements of customers in mind, we are instrumental in providing Meenakari Glass Top Pot. Being a noteworthy enterprise of this industry, we are offering a wide spectrum of Glass Butter Pot. 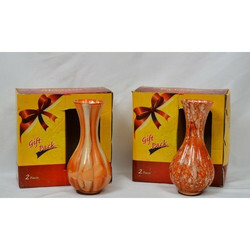 Vast collection of flower Pots and Vases are available to you on demand. Various colors, shapes, sizes or any other job can be done as per clients requirement and even Special packaging can be done on demand. Our products are exported in US, Europe and middle east countries. Being a customer oriented enterprise, we are engaged in providing a wide array of Floraled Flower Pot.